Looking at the summaries i provided above it’s clear that the share of African born slaves with specified ethnic or regional origins is very low compared with the previous censuses i discussed. For Saint Kitts it’s only 14% and for Anguilla it’s as low as 2%! In a way this leaves the possible ethnic origins of the locally born Creole slave majority still much in the dark. Had the census been held around 1750 instead undoubtedly you would get a very different overview of African birth places and regional proportions. Using the timespecific data from 1817 & 1827 to gauge the African ethnic roots of Saint Kitts & Anguilla is therefore misleading as most of their African roots date from an earlier period. Again the transition to a majority of locally born slaves or Creolization is crucial (see also “From African to Creole“). These age pyramids (taken from Higman 1984) might prove illuminating. The ethnic/regional African origins from the census only pertaining to the black sections. It’s obvious that the population composition of earlier settled societies like Anguilla, Saint Kitts but also Barbados is more “standardized” and has less atypical bulges in the middle than the ones for Trinidad & Berbice/Guyana who had a much higher share of African born slaves as i already mentioned earlier because their plantation economies were still expanding. Despite such limitations the information that is contained in these censuses can still be very valuable even for Saint Kitts and Anguilla. Especially since this kind of slave registration was not common practice elsewhere. I will expand on the background of slave registration in the British West Indies later on, but first let’s have a closer look at the census information at hand. For the greater part we’re seeing a repetition of most frequently named ethnic labels within each region. Even for the very limited census of Anguilla the patterns remain consistent. This can be important if we want to make plausible assumptions about the ethnic origins hiding behind the regional slave trade breakdown for countries which didn’t register their slaves in this detailed manner, like for example Jamaica or the USA. Senegambia, undifferentiated “Mandingo” predominate, the few specific Senegalese references always being a small minority like “Bambara”, “Senegal”, “Goree” or “Jollow” (=Wolof). Wind Ward Coast, usually undifferentiated shown as “Canga” which is the equivalent of Ganga” in Cuban and Puerto Rican records. They are thought to refer to various ethnic groups in the borderland between Liberia and Sierra Leone. But sometimes also specific mention is made of Cape Lahou which is in the Ivory Coast. Gold Coast, usually only geographical names like “Mina” or “Coromanti”. They could quite possibly be obscuring much of the ethnic diversity of Ghana/Togo and not just exclusively reflect Akan subgroups. Bight Of Benin, somewhere in between Gold Coast and Sierra Leone when it comes to the degree of ethnic details. “Popo” and “Ardra”/ “Allada” being very popular umbrella terms for coastal areas and “Chamba” for the interior. Hausa and Yoruba are also mentioned but in much smaller numbers. Interestingly in the St. Kitts census 1 Bariba individual is named from northern Benin and also a few Edo’s or Bini’s from southern Nigeria. Bight of Biafra, very consistently the “Eboe” or Igbo are combined with the socalled “Moco”, often assumed to refer to the Efik, but probably also incl. neighbouring ethnicities. Specific references to Cameroon or the interior are rare. Central Africa, overwelmingly people from this area are just labelled as “Congo”, indeed many of them might have been from one of the Bakongo subgroups and also culturally interrelated. But still given what we know about the extent of slave trade also other ethnic groups could be hiding under this label. Interestingly “Gulla” is mentioned a couple of times in the Saint Kitts census as well as in the Berbice one. Perhaps the same reference is being made as originally for the “Gullah” from South Carolina? The long history of Saint Kitts and Anguilla as English ruled colonies and their locally born Creole slave majority certainly seem to set them apart from Trinidad, Guyana and Saint Lucia and makes them more alike to islands like Barbados, Antigua and Nevis. 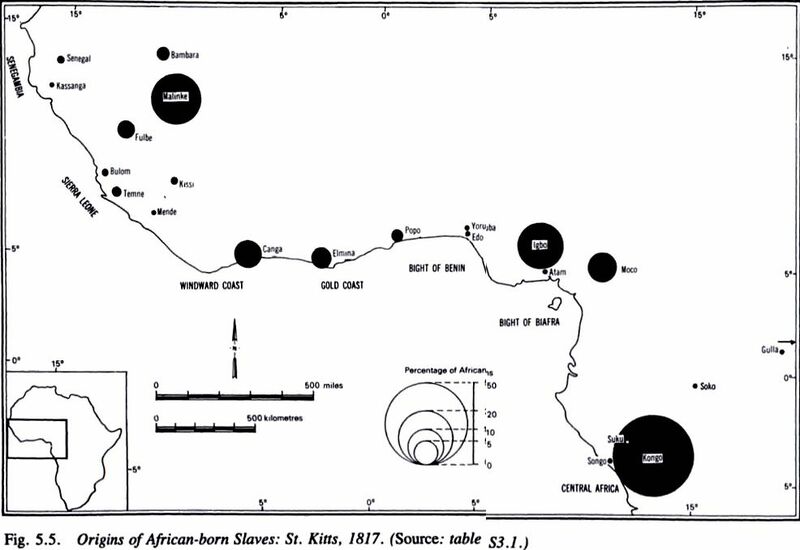 Distinct slave trade patterns might also have impacted on their regional mix of predominant African origins. Below charts are taken from the slave voyages database to get a better insight (unfortunately Anguilla doesn’t seem to be included in the database). Keep in mind that intercolonial voyages are not included and especially Barbados is known to have reexported many of its slaves. Judging from the first two charts it seems that Saint Kitts might have an increased level of ancestry hailing from the Bight of Biafra and more specifically (based on what i’ve discussed above) from eastern Nigeria with the Igbo and Efik most likely to be most important. Second in place comes Central Africa and third the Gold Coast. In the census there was indeed a marked presence of Igbo and Congo but not so much of “Coromantee”. We can therefore assume that it’s more so the Creole or locally born slaves from Saint Kitts who already incorporated these ancestral connections with Ghana, predating the timing of the census with many decades. While the relative share of “Mandingo” taken from the census for Saint Kitts and especially Anguilla is very likely to be overstating their overall contribution throughout slave trade history to these two islands. The following two charts are showing how a majority of all the Africans brought over in direct slave voyages to Saint Kitts arrived in between 1726-1775. Similar to Antigua, while for Nevis most Africans arrived even earlier in between 1676-1700 and for Barbados it’s in between 1676-1750. Remember that intercolonial voyages are not included but still this already provides a major hint as to why these islands were having a majority of locally born slaves at the time of the 1800’s census and most likely already in the late 1700’s. And it probably also explains some of the proportional differences in the regional breakdown of these four islands, especially for Bight of Biafra and Gold Coast. However, more relevant for this blog’s purposes, only a subset of slave registers also included the ethnic backgrounds of African born slaves. These being the ones that i blogged about already (Trinidad, Berbice, Saint Lucia). Slave registers were also kept for other former English colonies like Jamaica and Barbados but to my knowledge they did not contain any data on African ethnicity. This is most unfortunate as it would be of the greatest importance if such information would be available for all English ex-colonies. Not to speak of course for other countries of the Afro-Diaspora, like the USA, Brazil, Hispanic America, or former French & Dutch colonies. I am personally only aware of similar slave censuses, incl. ethnic details, being held in Sierra Leone (see this blog post), Cape Verde (see this blogpost part 1 & part 2) as well as Guinea Bissau (see future blog post). On the other hand having these few ethnically detailed slave registers for Trinidad, Berbice (Guyana), Saint Lucia, Saint Kitts and Anguilla makes them all the more so unique and both historically and socially immensely significant. 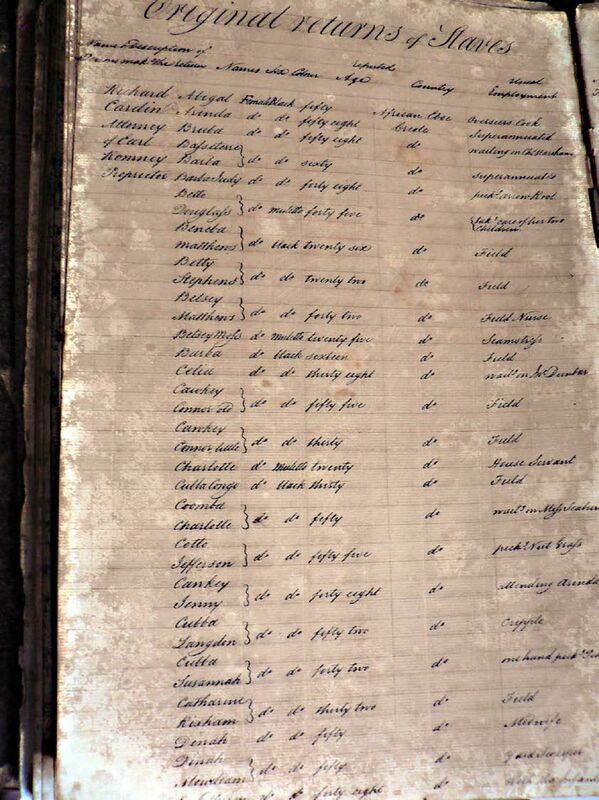 Below page is taken from the Saint Kitts register, if you zoom into the image you will see that there’s several columns for describing the characteristics of each slave. The second to the right is called “Country” and was used for stating birthplace. You will notice that only on the top there’s one person being described as “African Eboe” while all the others below are labelled as “Creole”, that is locally born and in Saint Kitts most likely. Illustrating the slim chances of tracing back your ethnic African roots in surviving archives. But also showing nothing’s impossible and at least for this one person (Abigail?) their ethnic identity as an “Eboe” was not erased but instead lives on for any descendants to rediscover. – Higman, B. W. (1984). Slave populations of the British Caribbean, 1807-1834. – Walicek, Don E. (2009), The Founder Principle and Anguilla’s Homestead Society, in R. Selbach, H.C. Cardoso & M. van den Berg. eds. Gradual Creolization: Studies Celebrating Jacques Arends, 349-372. This entry was posted in Anglo Caribbean and tagged Anguilla, Saint Kitts, Slave Register. Bookmark the permalink. ← St. Lucia Slave Census of 1815 , reflecting English or French Slave Trade Patterns? Fascinating and extremely heart breaking as well. The documentation of slaves and where they came from is a great historical record but it just greatly saddens me. Excellent information. My maternal side of the family originates out of Saint Kitts. My grandmother and mother were both born in Saint Kitts. Ancestry tests that I have done are indicating large amounts of DNA from Ghana/Ivory Coast ( in one/Ghana only in another) and Nigeria among other’s. Could you help me determine what tribes that would be from with my maternal roots in Saint Kitts? My grandmother’s maiden name was Israel as well if that helps. I would be great to find out my direct African tribal heritage out Saint Kitts. Thanks in advance. Thanks for responding. I will read the blog post. Thanks for the information. Yes, please start that service helping to locate African DNA matches. That would be great!